Mac compatible ID Card Maker Software design and print photo added ID cards on Mac with option to add text, images, barcode and signature. Software is also having option to design visitor ID card or gate pass using visitor ID Gate Pass Mode. You can design different types of ID cards including Employee ID Card, Student ID Card and Visitor ID cards with different barcode value and text. Software helps mac users by generating multiple id cards using Excel data file having ID Card details. Using this software, You can send designed ID card to the specified E-mail ID using E-mail setting option. Print designed ID card using advanced print settings with support to all major types of printers. 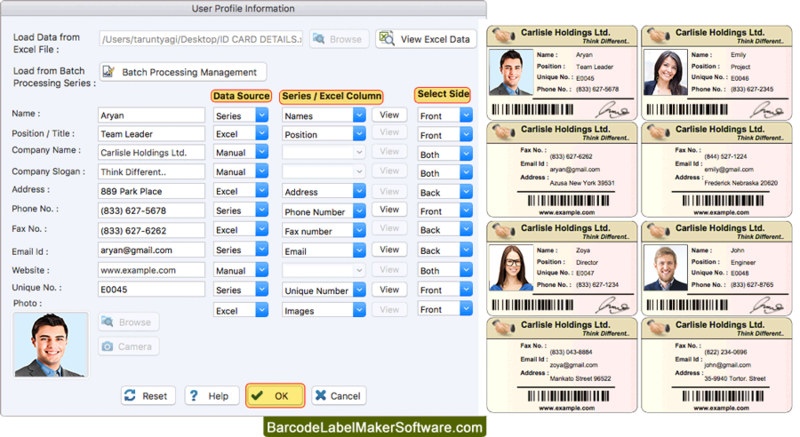 Batch Processing series option to generate multiple ID cards with different barcode value and text. To add photo on id cards you can capture image using camera option or you can browse the location of that image. 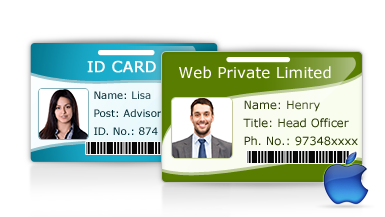 Print designed ID cards using flexible print settings of software with support to all major types of printers. 'Live Group and Batch Processing Mode' to create multiple ID cards for group of people using excel file. Email Settings is also available to send designed id cards at specified email address. If you are designing visitors id card then software provides option to add all visitor's details to the database. Send your designed id cards at specified email ID using email settings option. Software provides option to save designed ID card log (in .did file format) for future usage. You can crop single or multiple images, if required while designing id cards using Image Cropping Tool.